You are currently browsing the tag archive for the ‘San Cristobal’ tag. San Cristobal -snorkelling with sea lions and turtles – WOW! A very early start today. Met by Javier at 7am at the hotel and walked into the harbour to catch our boat “Andy” to the island of San Cristobal. As we were pulling out of the harbour we saw some incredible waves – it looked like the swell has been building. 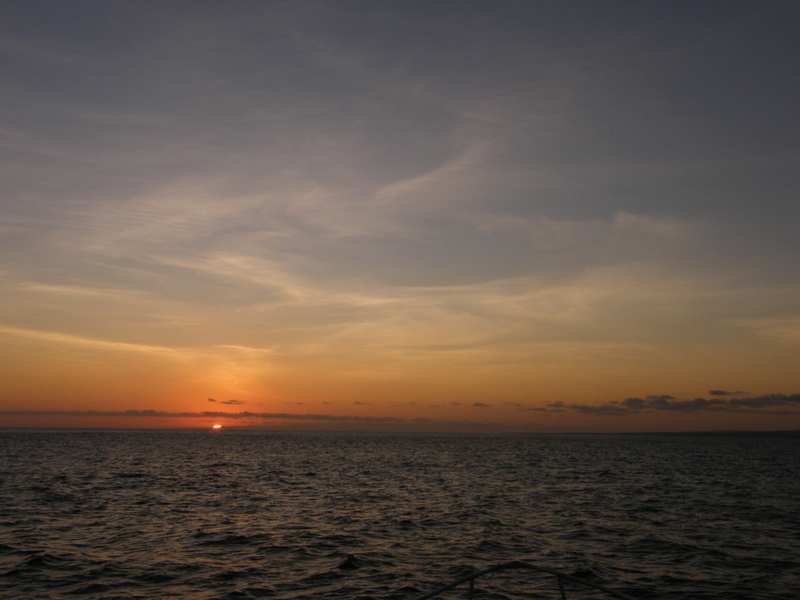 In a little over 2 hours we pulled into the bay where Charles Darwin first set foot on the Galapagos Islands. The spot is marked by a statue. Overhead, frigate birds flew in lazy circles above us. They nest above the bay in their breeding season. It was our hottest day on the islands, we disembarked in the harbour and had to avoid tripping over the sea lions. 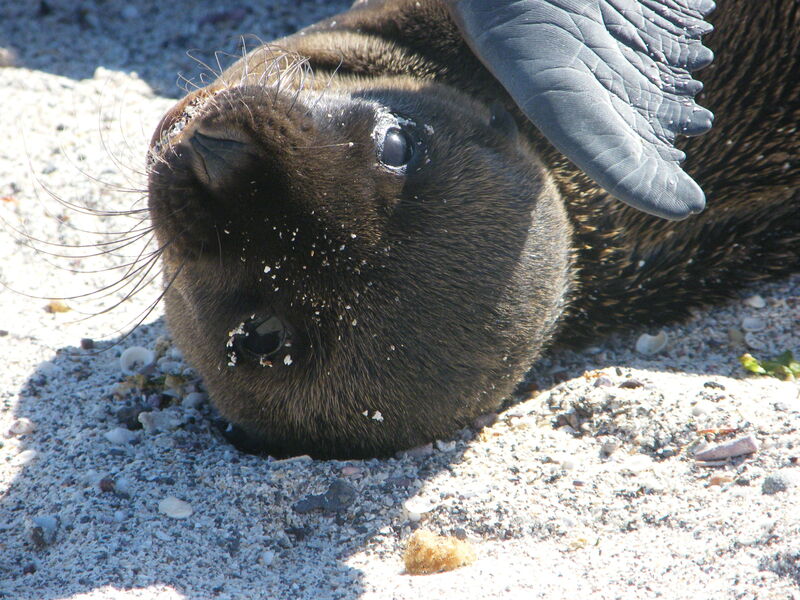 It seems that the sea lions have chosen San Cristobal, just as the marine iguanas have chosen Floreana to set up home. We walked to the interpretation centre where we had a talk on the history and conservation of the islands, followed by a look through the exhibition where we saw more of the history. We were all amazed at the amount of development shown by some aerial photos of the islands. 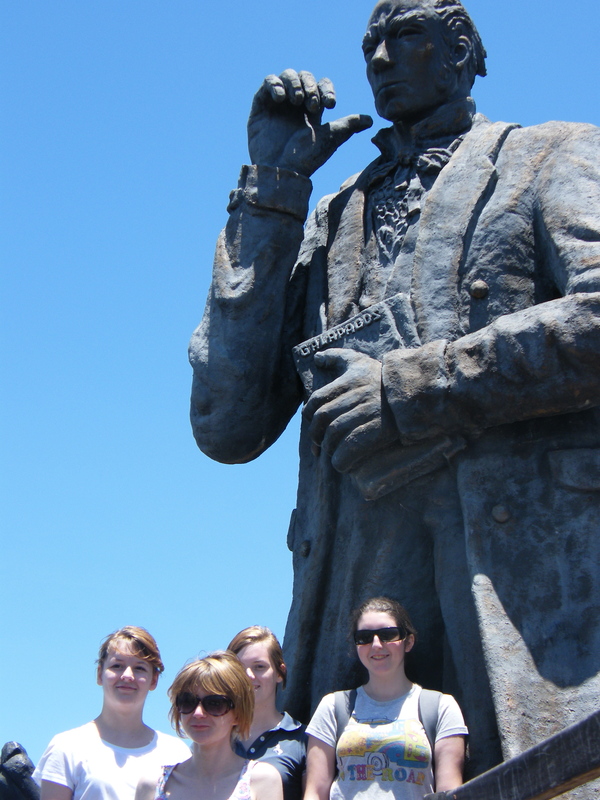 We then walked to view the statue. Like everywhere in the National Park, tourists are only allowed to walk on the paths to prevent damaging the habitat. It reminded me of the Ray Bradbury short story I read at primary school, A Sound of Thunder, in which a hunter travels back in time to shoot a dinosaur. The hunter is only allowed to shoot a Tyrannosaurus rex that is about to die of natural causes. In the panic of the hunt he steps off the path and kills an insect (I think – it was a long time ago!) Upon his return to the present time the hunter notices that things have subtly changed. I wonder if a modern day tourist stepped off the path and trod on, say a tortoise’s nest, it would affect the future of evolutionary progress. I love the idea of contingency! What will happen to the tortoises released onto Pinta Island – will they evolve similar body plans to Lonesome George? Or will conditions have changed to suit a different shaped shell? Or even if the conditions were exactly the same, would something different happen every time we replayed evolution? Kurt Vonnegut’s novel Galapagos is also a great exploration of the idea of contingency. Stephen Jay Gould explores the idea more fully in Wonderful Life – The Burgess Shale and the Nature of History. After a hot trek back into town, we had lunch at a restaurant overlooking the harbour, listening to the honking of the sea lions. Then it was into a taxi and off to the beach. Again some incredible waves. The Galapagos is sure to take off as a world class surfing destination. The path was criss-crossed with lines left by the tails of marine iguanas as they moved from their basking area to the sea to feed on algae. 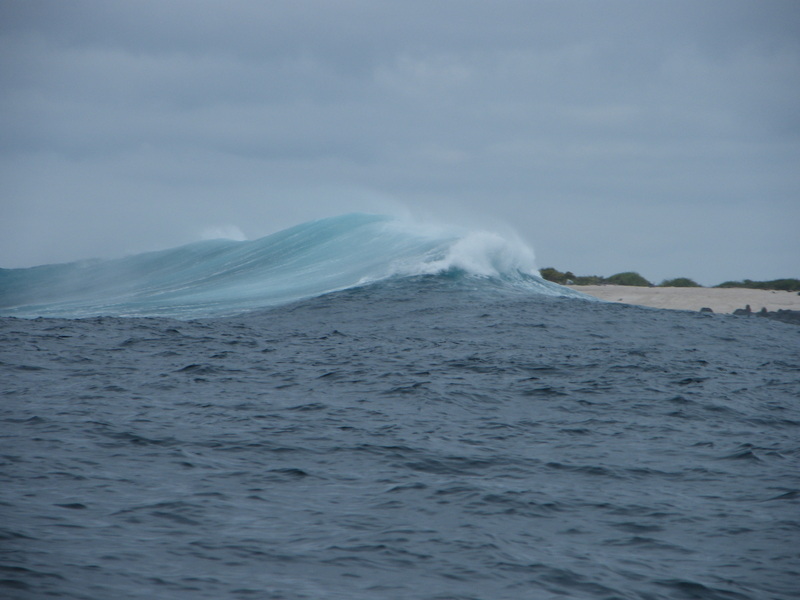 We came to a small reef that the huge waves were breaking against that formed a small lagoon of more sheltered water. 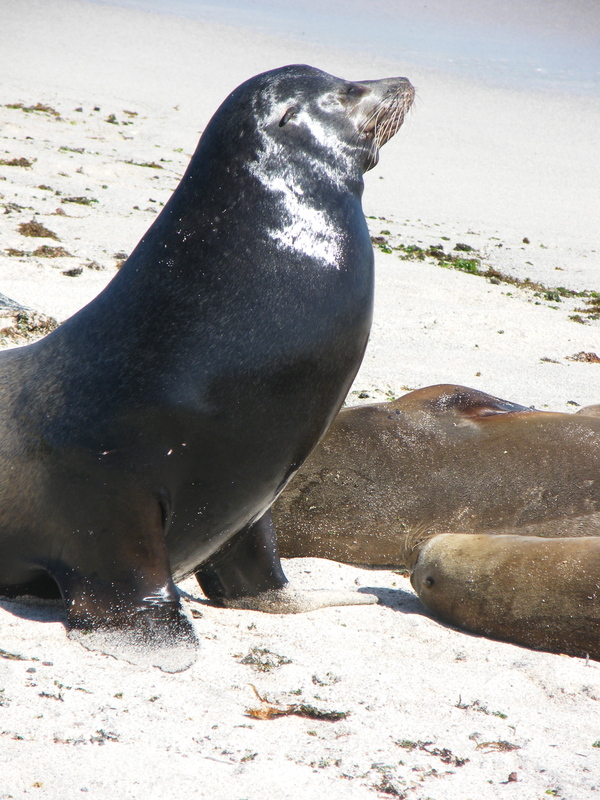 On the beach of the lagoon were perhaps 50 sea lions – females and juveniles. In the water was the dominant male, protecting his harem by swimming up and down, honking and occasionally getting out of the water and shaking his head about. He looked impressive with his swollen head – much larger than the females. For lots more pictures have a look at the Flickr set. Then it was time to get into the water. Javier showed us the best place to get into the water so that we didn’t disturb the dominant male. The water was quite murky due to all of the sand and seaweed in suspension due to the size of the waves, bringing visibility down to about 3-4 metres. However the animals must have been told that so they made sure they got exceptionally close. Within a minute of getting in the water I found myself practically on top of a large turtle less than 5 metres from the shore. The water was incredibly shallow and I had to avoid bumping in to it. I managed to follow and film the turtle for two and a half minutes – an incredible experience – its flippers moved so gracefully. At one point we made eye contact – awesome! Then there were the sea lions. They loomed out of the gloom towards us. Once they saw that we had noticed them they charged towards us, blowing bubbles through their nostrils, only veering away at the last moment. It took some getting used to! I don’t think any of us will forget that experience. As time went on the sea lions got even more confident. Coming at me with open mouths and making honking sounds underwater – can just be heard in the latter parts of the video. One then tried to grab one of my fins in its mouth!! It was amazing to see these acrobats of the water, pulling somersaults, changing direction in an instant and most of all having fun! We are definitely not the only species capable of doing that. They reminded us of playful puppies. I was the first out of the water and was described as, “The most animated we have ever seen you,” by Becky! I will certainly never forget my time on San Cristobal. Amy Turner was escorted out of the water by the dominant male – he must have seen her as a threat, or maybe a potential addition to his harem! We caught a catamaran back to Santa Cruz – a slower ride, but made worthwhile when we were buzzed by a pod of dolphins leaping out of the water. The icing on a wonderful cake! The icing was then decorated with a beautiful sunset. Thank you San Cristobal – we shall never forget you!